Debating the meaning of life, liberty and the pursuit of sappiness. 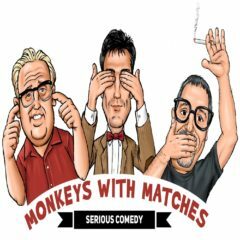 Monkeys With Matches is a podcast started by 3 old friends. Having known each other since their teenage years, they haven't shut up since. Jonathan Thymius is a nationally recognized comedian and actor who has starred in films, late show television, commercials and was a finalist on Last Comic Standing. Comedy is a huge part of Jonathan's life and will be well represented on this his primary podcast. A new sitcom about a man and his podcast will co-star Jonathan in early 2020. Craig Fry is an established musician and sound designer. Having played in rock bands, orchestras and everything in between, Craig is the educated calm during the storm. Scott Brazieal is a multi talented musician, composer, screenwriter and lounge chair philosopher. He has played with bands like Von Zamla, Thinking Plague, 5uu's, and has toured with Cassiber, Skeleton Crew and many others. Scott is now working on his second film, No Volvere.